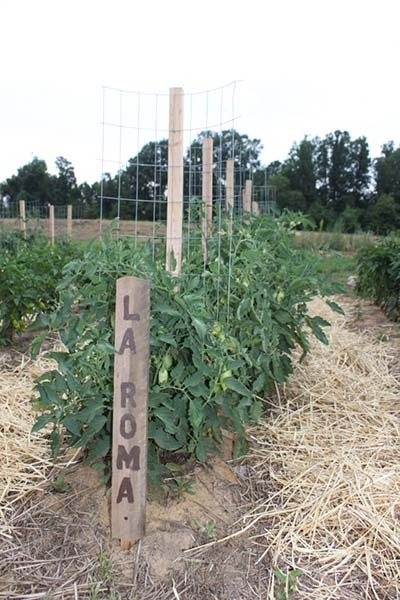 Do you have a smaller yard that has limited growing space for your tomato? 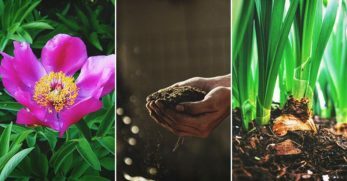 What if you just don’t like the idea of having a huge garden because of maintenance? 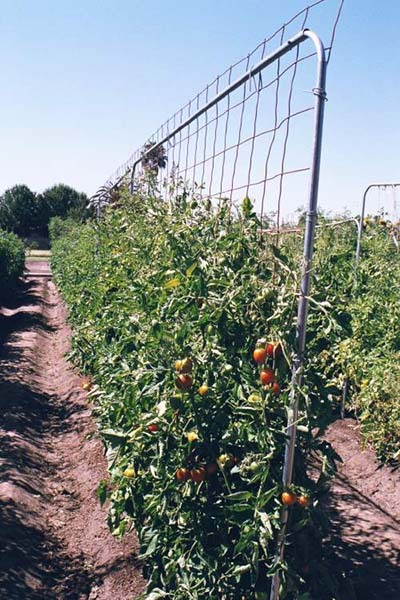 That is why we’ve put together a list of tomato cage and trellis ideas that can help you to grow vertically. Not only these trellis plans are eye-catching, they're fully functional. Now, doesn’t that sound like the perfect concoction? 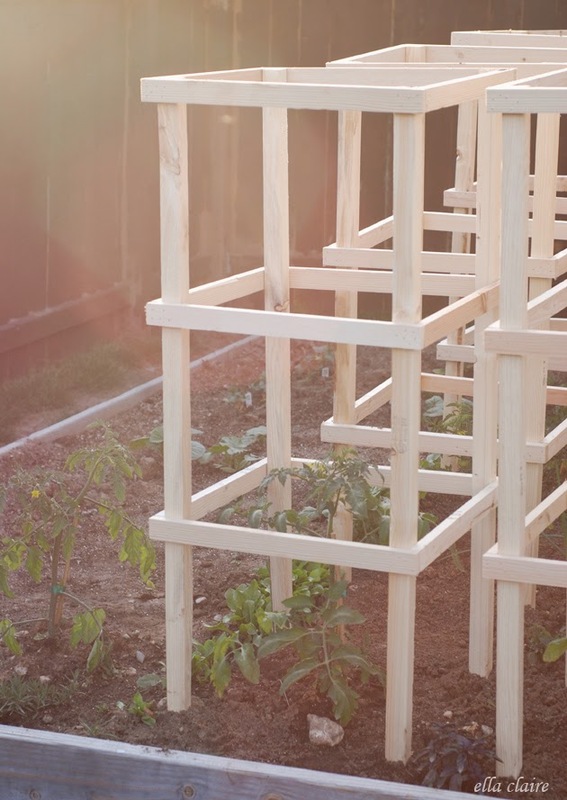 This trellis idea is the epitome of elegant simplicity. Basically, you just build two small above ground beds. Once those beds are set in place, you’ll need to add a wire trellis that connects the two. It will make an archway. 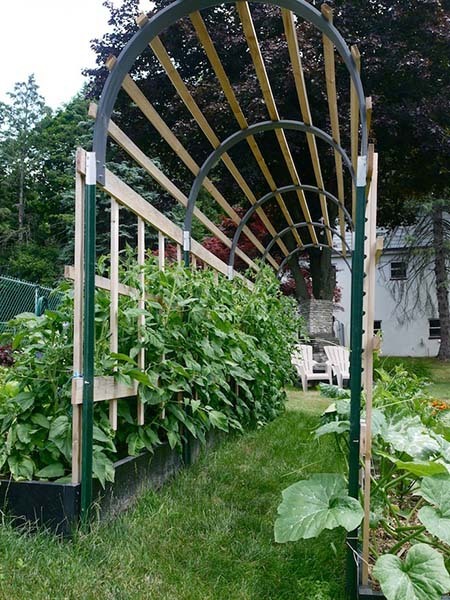 This is such a cool idea because if you grow green beans, squash, pumpkins, or any other vine related plants then you’ll have a fully covered archway. It will give your garden that whimsical feeling. 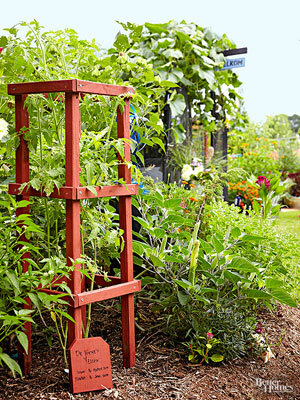 This tomato trellis idea is one that screams ‘HOMESTEAD.’ It is homemade, rustic, yet fully functional. 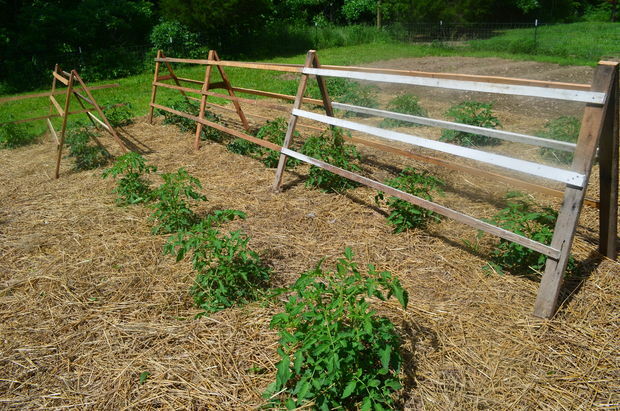 So what this woman did when creating her tomato trellis was drive t-posts into the ground. She used some rebar and then twine. The basic concept is that the t-posts go into the ground, the rebar goes across the top, and then you run twine up and down the frame. You’ll then tie the twine to the base of the tomato plant. So when the tomato plant grows, it will grow right up your homemade trellis. This allows your tomato plants to grow straight and strong. 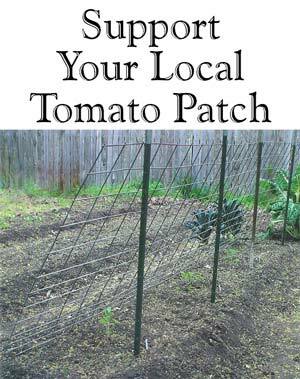 All the while, it saves you the headache of staking all of your tomato plants. And if you are like me, you grow quite a few tomato plants. 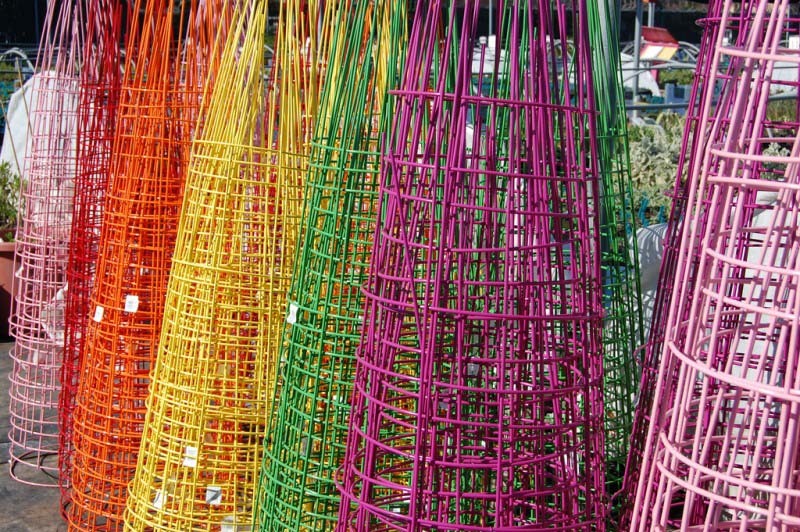 I love this tomato cage! 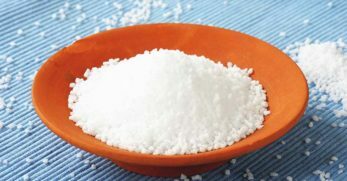 The reason being is because it is simple, easy to DIY, and seems to be fairly inexpensive. That's everything I love in a homestead project. You’ll need 2x2x8 boards and 1x2x8 boards. You’ll then take these boards and cut them into different sizes. After you get the different dimensions cut, you’ll need to start screwing or nailing the wood together. You are basically building a wooden box for your tomatoes to grow strong and tall. The best thing about this is that it is sturdy. Don’t you hate it when your tomatoes get so big and beautiful towards the end of summer and then their support just gives way on them? Well, that’s the great thing about this tomato cage. 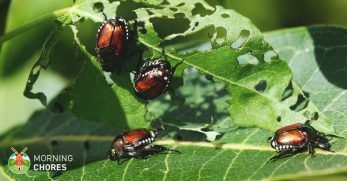 It will not give way to your full-figured tomato plants. 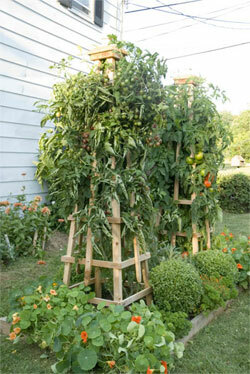 This is another tomato trellis that has ingenuity written all over it. The authors of the post-drive posts into the ground. Sounds pretty easy so far, right? And then they use livestock paneling. They actually place the posts on one side of the bed and then place the livestock paneling on the other side of the bed. Once that is in place, they just allow the livestock paneling to lean over the bed and rest on the posts. This will allow any plants that you grow in the bed (that needs it) to grow up into the livestock paneling for support. I also love this idea because it is sturdy but is easy to take down when it is not in use. 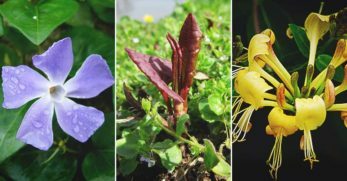 Yet, another fantastic way, to grow your plants that need room to run. For those of you all that are like me and have those country roots running deep (I had to refrain from using the term ya’ll back there) you might be wondering what an obelisk is? It sounds kind of fancy, right? Well, I’ll admit it, it sounds fancier than anything I use around my homestead. But I digress, it is basically a snazzy word for a trellis that resembles a lighthouse shape. This particular obelisk is known for how easy it is to make because there are no angles that have to be cut anywhere. All you do is cut wood to different lengths (which she provides in the post) and then build a 4-sided ladder. It isn’t the simplest trellis I’ve mentioned but if you have your heart set on an obelisk, this could be the plan you’ve been waiting on. Years ago the Topsy-Turvy Upside Down Tomato Planter hit the market, and the dream for growing your tomatoes upside down was born. That is what this one is all about. If you want to buy a planter to grow your tomatoes upside down then there are options available. But if you want to DIY it to grow your tomatoes upside down, this is a great option. It is so cool how this person is able to transform 5-gallon buckets into upside down planters. They basically start by drilling a small hole in the bottom for the tomato to run out of. Then they drill holes for the chord to fit through that is going to hold the bucket. They place newspaper in the bucket and place soil in it. 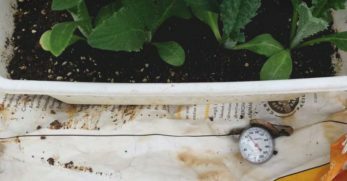 Right before planting the tomato plant, they cut a small hole in the newspaper that will allow the plant to grow through it and reach the outside of the bucket. So they use the newspaper to hold the tomato plant in place until it reaches a more mature state of growth. This is a really cool idea. I just might have to try it myself. This trellis is a little hard to see through all of the pictures of this post. So allow me to fill you in. Basically, they are building a fenced in garden. I guess they have large critters where they are because it looks as though their garden is similar to Fort Knox. As I was saying, in the midst of this build, they realize they had a bumper crop of pumpkins. So what do you do when you have pumpkins that randomly come up on their own? Why, you build a trellis of course! So they built this little trellis out of wooden stakes and some metal fencing. The wooden stakes will lead this crop up to the roof where they have a ceiling made of old metal gates. Are you seeing what is going to happen here? 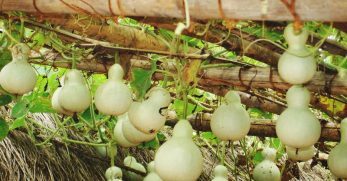 After the pumpkins grow up the trellis and latch on to the gates, they are literally going to have a garden ceiling filled with dangling pumpkins. That sounds pretty neat to me. 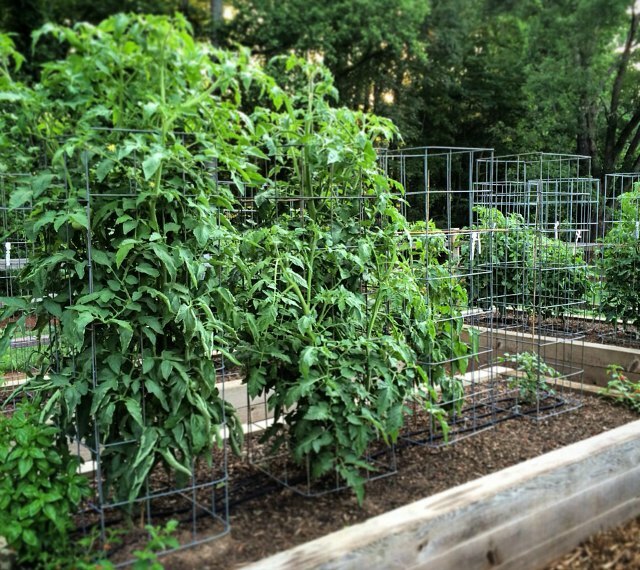 If I grew a smaller amount of tomatoes, this would be the tomato cage of my dreams! Unfortunately, I grow a ton of tomatoes, and I don’t think I could build enough of these to cover what we do. However, if you are not a tomato addict (like myself) and actually grow a regular crop of tomatoes, do me a favor? Build this for me! Post your pictures so I can see how great it turned out and allow me to live vicariously through your tomato plants. So now that I’ve carried on aren’t you the least bit curious how she created this wonderful trellis/tomato bed? Well, allow me to fill you in. 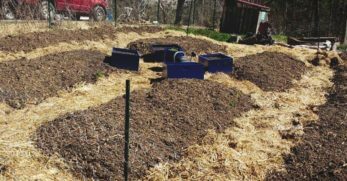 All she did was build an above ground garden bed. She even states that it doesn’t have to be an above ground bed. After building the bed, she puts two wooden posts in the ground and then one long beam that connects the two posts. Then, she simply drapes bailing twine from the top beam down to her tomato plants. This allows for the plants to grow right up the twine. It looks very organized, and I’m in love with it. 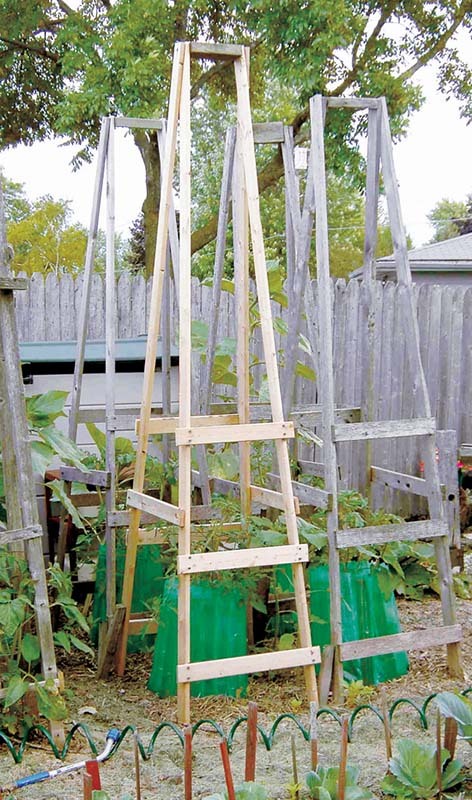 This is a very inexpensive and easy method to train your tomatoes to stand straight and tall. All you have to do is put two metal poles in the ground. That sounds easy enough, right? After you put the metal poles in the ground, you run one metal pole across the top. Then add a horizontal line of string every 5 feet. So when your tomatoes grow to meet the first wire then you clip the vines to the pole with a clothes pin, plastic clip, or Velcro. You do this every 5 feet. 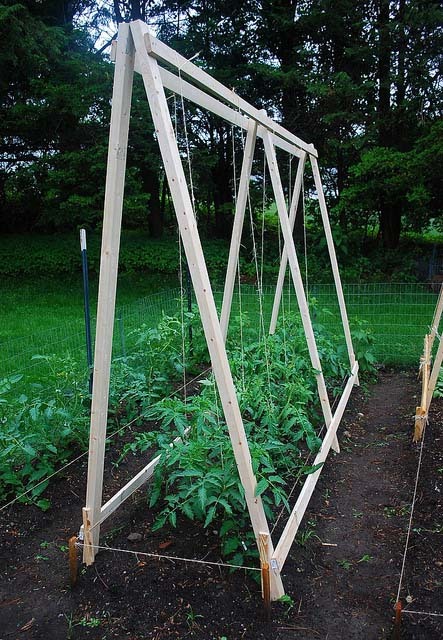 However, the only drawback to this type of trellis is that it is not sturdy enough to handle beefsteak tomatoes. The author does give ideas on how to make it sturdier, though. The picture shown above is the sturdier version. This tomato cage is a very sturdy one. It starts with a large PVC pipe that you actually attach the tomatoes to. 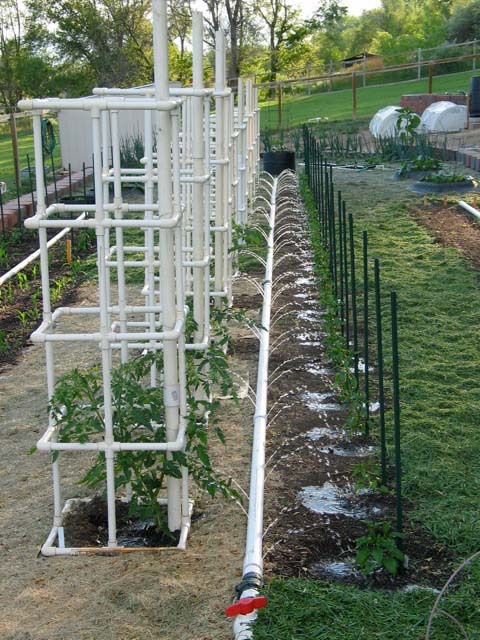 However, there are smaller PVC pipes that are formed into a box shape from the bottom of the tomato to the top. This gives the tomatoes ample amount of room to grow and lots of support. I truly like this idea because it is inexpensive and should last for years to come. As you can see on the site, this woman grows monster tomatoes. So these are a great option for any type of tomato plant. The design is simple as well and is something even the newest member of the DIY Club could figure out and build quickly. I give this trellis two thumbs up. This is another tomato cage that I absolutely love! My reasoning is the fact that it is sturdy, functional, and potentially free. So if you grow bamboo or know someone that grows bamboo then you are in business. I encourage you (if you have the space) to grow bamboo. It is great to build with and animals can eat the shoots off of it as well. Anyway, this tomato cage is your basic box/cage shape. They begin building it by putting four bamboo posts in the ground. Then they put two bamboo supports in on each side. These are very sturdy because bamboo is a very sturdy material. It will also be easy storage during the winter because you can simply tie the cage together and then untie it to store it for the winter. Ultimately, this is a great tomato cage. If you need a tomato cage that will serve its purpose during the summer and be easy to store during the winter months then this is it. This tomato cage is actually folding. Amongst the fact that it is easy storage, it also requires few materials and is something that someone who is somewhat familiar with building things could whip up in a jiff. You need a few different sizes of wood to build this cage and some screws. The basic idea is that you are building two separate ladder pieces that can fold and unfold together. And you will also have to build the connecting hinges on the side like all ladders have. Because of its unique design and simple materials list, this is a great option for larger tomato plants as well. Wood doesn’t bend as we all know so go ahead and grow those prize-winning beef steaks inside this thing. 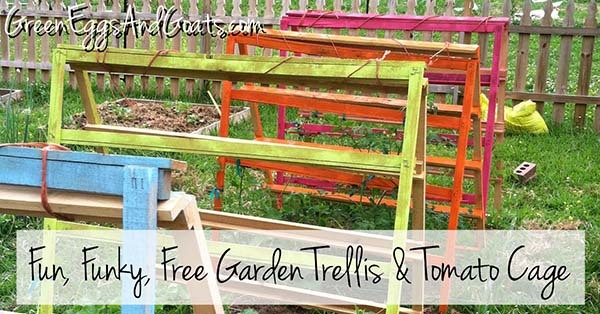 This trellis is an easy DIY project. 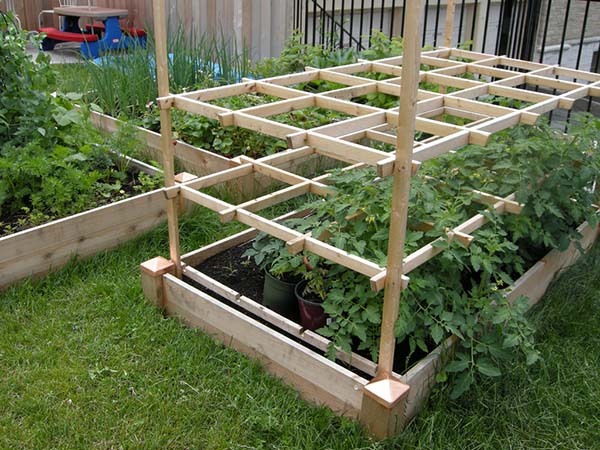 It is the basic box design of a trellis, and you only need a few different sizes of wood to build it. So you begin by putting the four posts in the ground. You will then connect the four posts with rungs. The tomato plant will grow big and strong on the inside of it. The only somewhat tricky part to building this is keeping everything square. With the proper tools, you should have no problem. So now that you know how to build it, don’t forget you can paint it as well. Painting your trellis really gives it your personal touch and is what adds character to your property. I love this type of trellis because they are so classic looking and not difficult for those of us that like to do things ourselves. This one is not to be confused with the folding cage. This was is not a cage at all. Instead, it is a trellis. The main difference between the two is that the folding cage is closed in on the sides while this one is not. So instead of building this one from thicker wood, it is actually built from slats. You will need some hinges and staple gun too. 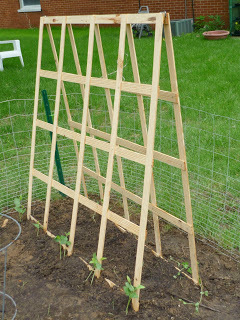 You will begin by building the outside square of one side of the trellis. After you do that, you will need to run the wooden slats vertical and then horizontal to create a checkered pattern. After this, you’ll need to repeat the same steps for the other side of the trellis. Then you connect the two sides with hinges, and you are ready to go. I like this option because not only is it creative, but it also stores well when not in use. On most of these posts, you see that wire cages have taken on a bad reputation. People don’t like that they are flimsy, or they say they don’t last. What everyone overlooks is how inexpensive and versatile they can be. Take this spin on them for example. 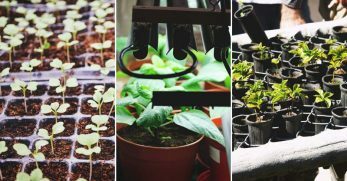 Let’s say you need a tomato cage this year, but you don’t have the time or money to invest in some of these other projects. That’s okay. Go ahead and buy the wire kind. Then you’ll get to add your own flare to it without much time or money invested. So how you make your wire tomato cages your own is by spray painting them. If you want some additional color in your garden paint them each a different color. If you want to add a touch of classic style to your garden, pick out a great classic color and paint them all in uniform. There really is no end to the possibilities here. Happy spray painting. 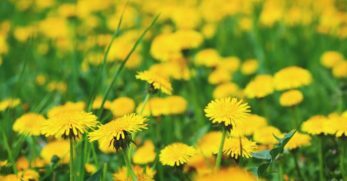 Here is to a bright summer! This tomato cage was created by someone that got so frustrated with the flimsy quality of the wire cages. Now, as I mentioned, if you want to make a small investment and buy the wire cage that is totally up to you. But if you are wanting to grow large beef steak tomatoes year after year, it might be a wise investment to make a cage similar to this one. They began creating this wooden tomato cage like a lot of the others we have already looked at. They used four posts and then connected the sides with rungs of wood. After doing this, they placed them in the ground and tied the tomato to parts of the cage to train it to grow. However, these people took it one step further (which I love). They painted their tomato cage. 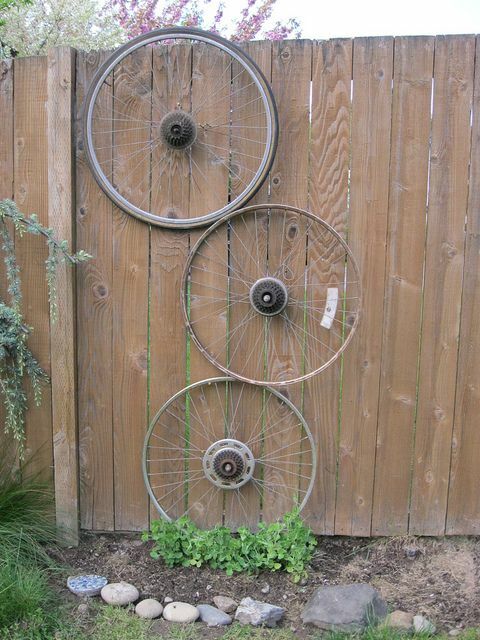 So not only is it sturdy, but they also used it to add a splash of character to their garden. Here is another obelisk. I want to start off by saying if you grow pole beans this might be a great option for them. 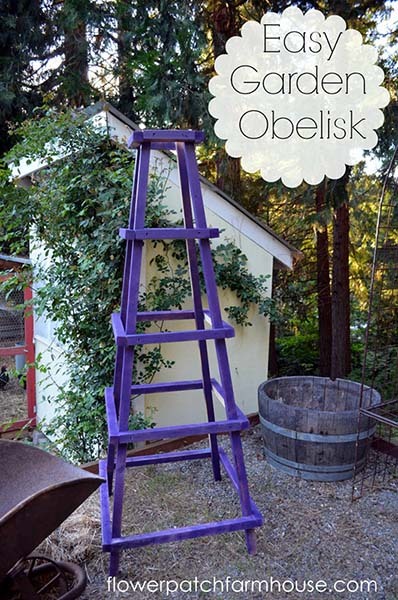 This obelisk is very tall and sturdy so it should give your beans ample amount of room to grow. So now that we know what this obelisk could be good for, how do you make it? Well, it is very similar in detail to the other trellis. You need to buy your wood. She provides a materials list with the sizes you’ll need. Because of this very helpful list, it makes building this obelisk much easier for the newest of DIYers. She actually lists different options for your wood. For instance, how you can buy the wood cheaper if you have a table saw and also what you can do if you don’t have one. So after you sort through the wood options and get your wood to start the build, you’ll construct two sides of a ladder. Then add ladder rungs to the outside to give a square shape. It will then grow upward and begin to look like a lighthouse in appearance. 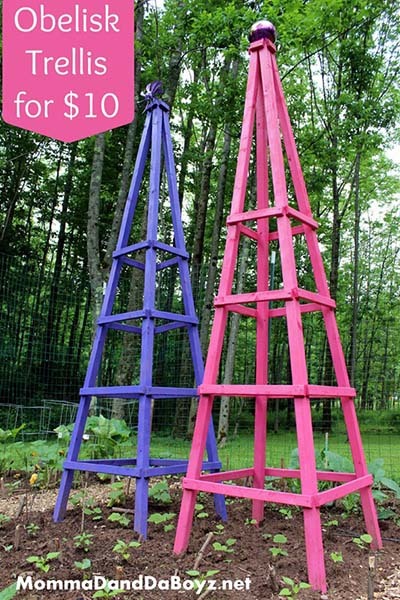 She also adds a splash of character to her garden with this creation by painting her obelisks different colors. This is a truly easy yet beautiful creation for your garden. 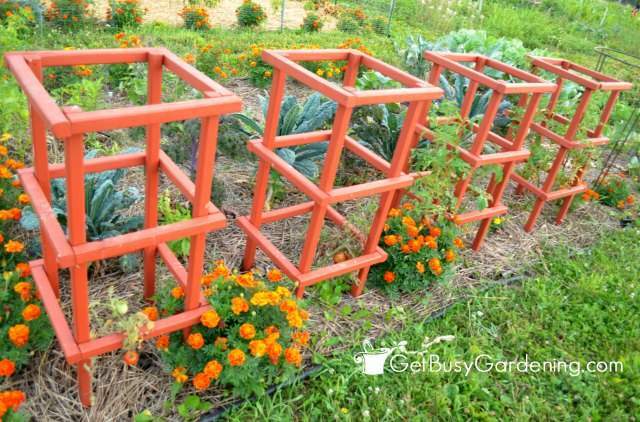 You can grow most anything with this trellis. 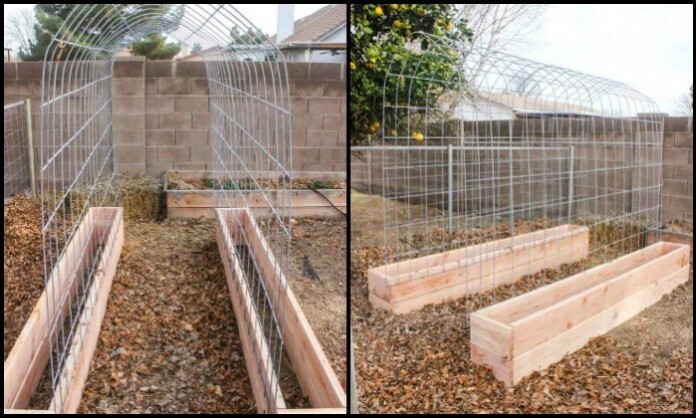 The trellis can actually be built in three easy steps. How amazing is that? So we’ll begin by measuring the area that you’d like the trellis to be. The author gives a detailed materials list so you’ll know what to buy for the next steps. After you get the area measured, then you’ll take four pieces of wood that you will be using as the main structure support and make two teepees with them. Once you get those in place, you’ll tie the tee-pees up at the top. Then you’ll begin to tie the horizontal pieces to the trellis. It doesn’t get much easier than that. There is no drilling or hammering. All you have to do is tie everything together as you want it. This is a truly beautiful creation! It is simply stunning. 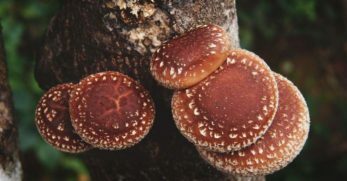 So now that I’ve drooled all over my computer screen because I’ve found yet another creation that I wish I could squeeze into my gardening area, let’s talk about how you can have it in your backyard. You begin by building two above ground boxes. They should be close enough in vicinity that you can create an arch between the two. Then you’ll make wooden slats that go up the side, and then use longer pieces of wood to run over the top of the archway. When this creation is done and the tomatoes are full, you’ll have a fully covered archway. 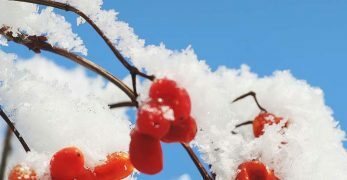 That creates a great way for your vegetables to grow and a picturesque scene in your very own garden. 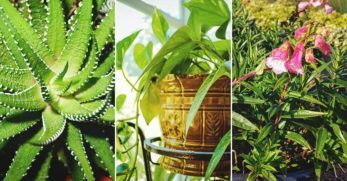 This one gives you multiple options of how you can take old items you probably have lying around your house and utilize them to help your plants grow. She begins with showing how you can use an old chair with the bottom knocked out of it as a trellis. It actually looks very beautiful. Then she moves on to old bike tires that she hung on the fence. This would help with plants that run more so than bush plants probably. Next, she took an old coat rack and put in the ground vertically so plants that run can run up it. It is actually a very cool idea. She follows up with crib railings placed in the ground vertically. This allows for plants that like to run to have the space to do so. The last three are my favorites. She uses an old door, a ladder, or an old mirror frame with string running across it to train the plants to grow on it. They all have a very classic feel that stand out beautifully. 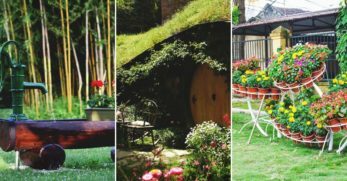 If you desire a garden with character, this is certainly one way to accomplish it. 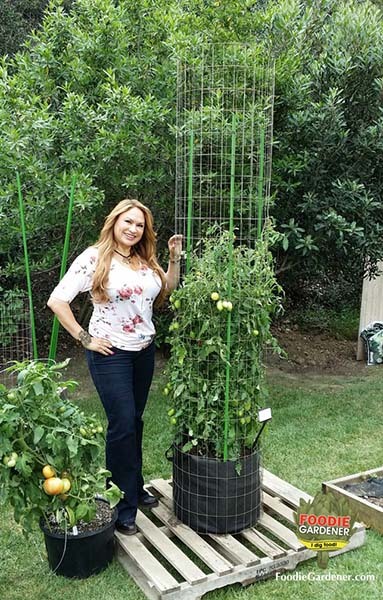 If you are looking for a whopper tomato trellis that will keep your plants from sagging, this is probably going to be what you were looking for. This trellis is built like an A-frame swing set. That is literally what it reminded me of. They built this trellis by placing four pieces of wood in the ground on either side. They put two pieces together to make the ‘A’ shape. Then they placed a beam across the top and a beam across the bottom. Finally, they ran wire from the top beam down to the bottom beam to train the tomatoes to grow up it. I’m going to take this option one step further and offer a smidge of creativity. If you want to avoid building the A-frame and have an old swing set, use it. You could actually take the swings off and use the frame. Then you’d just have to add the bottom beam and run the wire. 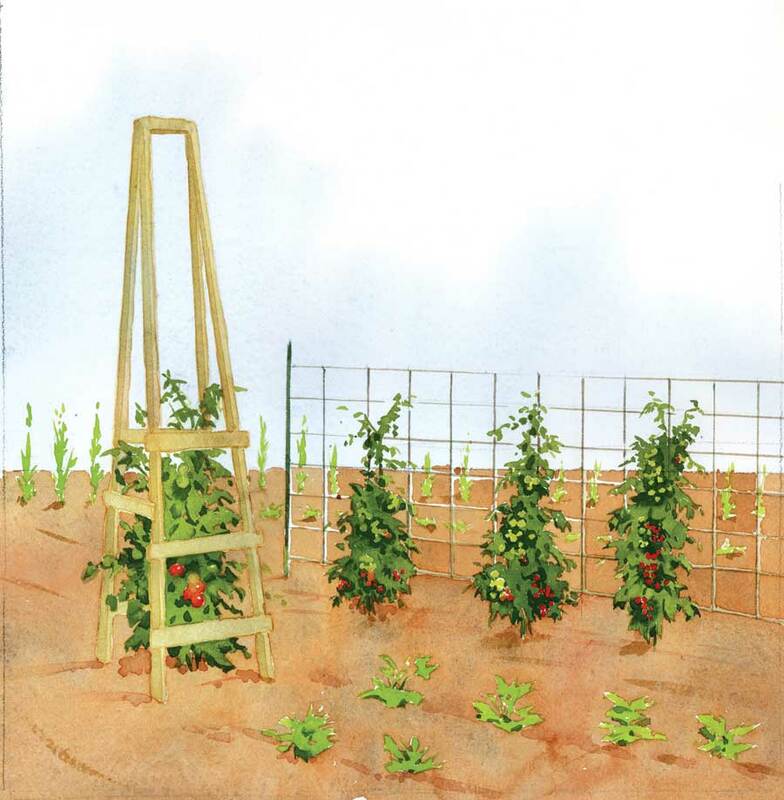 If not, this option appears to be fairly simple to build and would work very well at keeping your tomatoes standing tall. This trellis is meant for an above ground bed. It appears to be pretty simple to create as well. So you begin by putting four wooden posts in the bed. That is one in each corner. After you have them in place, you’ll need to make or buy a wooden slat trellis. 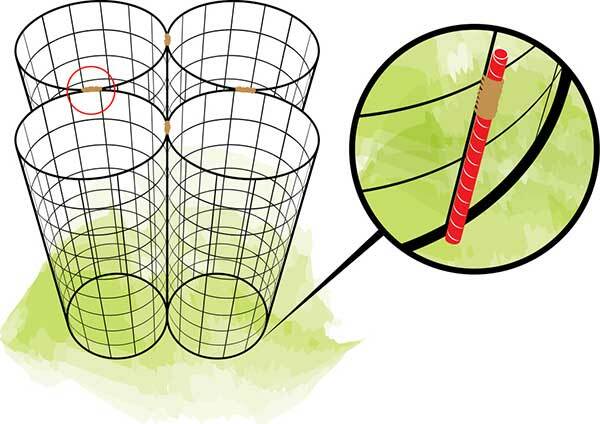 You’ll attach the layer of trellis to each of the poles. Then you’ll add the next layer of wooden trellis and attach to the four posts. 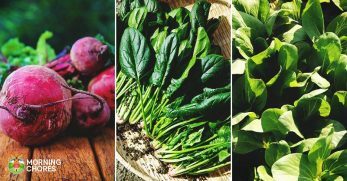 You can add as many layers as you feel your plants will need. That is really all there is to this one. I think it would work well for those planting in a smaller area and would certainly do the trick at holding your tomato plants up. This site gives you multiple options for great tomato cages. A lot of them have been previously mentioned in this post already. 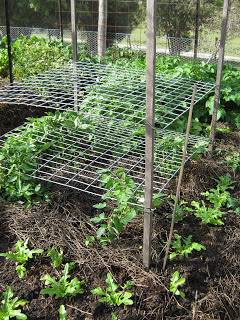 However, they do offer another great option for a folding tomato cage. It is constructed very similarly to the first folding cage I mentioned. You begin by building two sides of a ladder and add three rungs to each ladder. Then you’ll need to add braces on the side to make your cage sturdier. Then they actually recommend adding scrap wood at the top to stabilize it. I like these instructions because not only does it give you a materials list but it also provides the estimated cost and a site for full length detailed instructions. Building this cage is rather short, sweet, and to the point. However, that is a good thing because that usually equals simplicity. This is a very unique idea. If you have extra livestock paneling around your homestead then you already have what you need in order to build these cages. They begin by laying out the livestock paneling on a flat surface. He actually recommends a driveway for this step, but wherever works for you is fine. Then he cuts the livestock paneling down to size. After doing this, he places a piece of wood inside the livestock paneling where he needs to bend it in order to shape it. Then he bends and shapes the paneling until it forms a square. After this, he places it in the ground. That seems rather simple, right? The great thing about this cage is that if it can be used to work with large livestock then it can certainly handle holding up your big, beefy tomatoes. This tomato cage appears really simple to make. They begin by giving you a list of all of the materials you will need, which isn’t many. The main thing I noticed is that you’ll need work gloves and sharp cutters because of the materials you are working with. After you get all of your materials laid out, you’ll roll out the concrete mesh. You have to set a milk crate with a cinderblock in it in order to hold it down. Then you’ll cut the concrete mesh to the size you want. After that is done, you’ll roll it up and place it in the ground around your tomatoes. In case you were wondering, this is another obelisk. I love how at the beginning of this article that seemed like such an unfamiliar term but now it is old hat. But I digress, you build this obelisk like all of the rest. This one just looks really cool because you will literally have a tomato tower. No more bending over to pick those tomatoes. Now you’ll think you are picking fruit from a tree with this creation. So you begin with your four posts. You add the rungs all the way around until you have a box. It will then grow upward in shape and begin to resemble a lighthouse. It will then be that little beacon of light out in the middle of your garden. 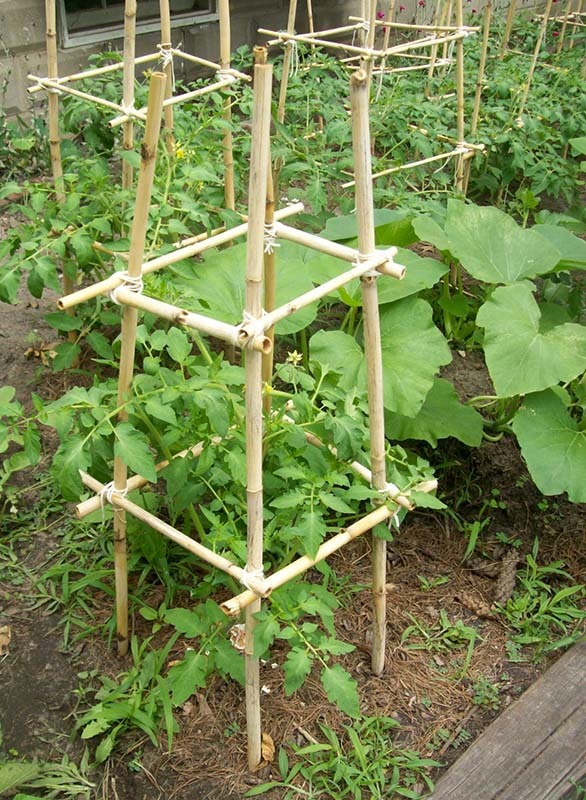 You want to talk about a simple tomato trellis/ cage creation, this is it. No bones about it. This idea was born in a pinch. The author needed a way to tie up her tomato plants. So she began looking around for what she had and boom, the stake A tomato cage was born. Isn’t that how most ingenious homesteading ideas happen? So you take welded wire fencing and cut it down to the size pieces you need. The drive an old stake in the ground. 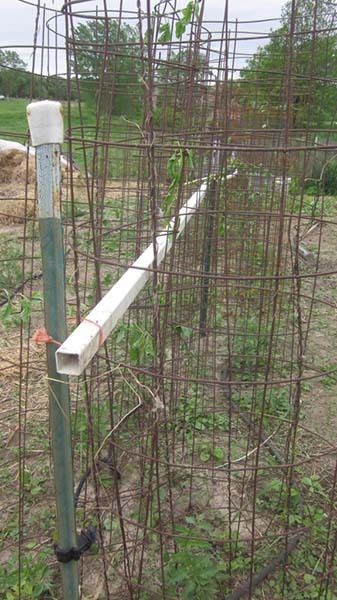 Attach the fencing to the stake in the ground on either side, and you have yourself a tomato cage. It is easy to construct and also does an amazing job. You can see what kind of job it did by her pictures. 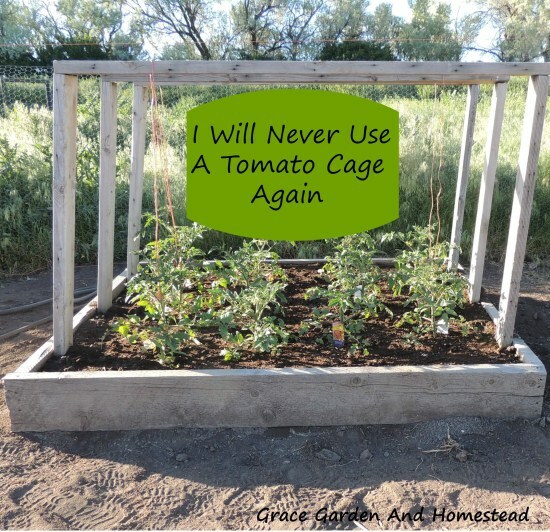 I love this idea for a tomato cage because of the ease in construction and durability. 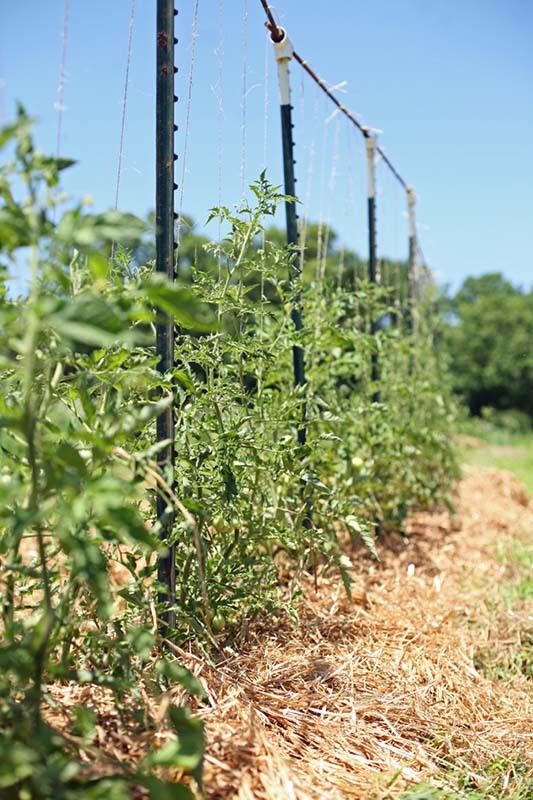 If it uses wire fencing, your tomatoes aren’t going anywhere. 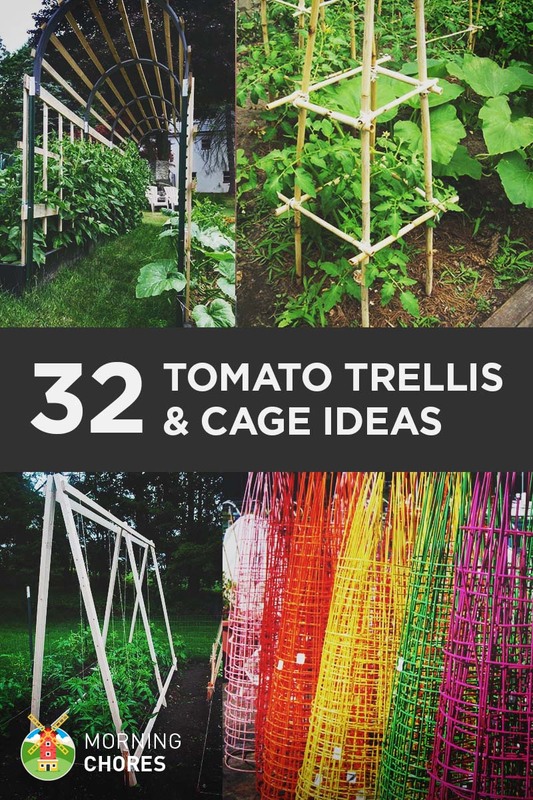 The author of this particular post claims this is the only tomato cage you’ll ever need. Now, it isn’t pretty but after reading the materials list, it certainly appears sturdy. You are going to use concrete wire mesh to construct this cage. As she plants her tomato seedlings, she inserts t-posts at the end of each bed. After inserting the t-posts, she slips wire cages made of concrete mesh over her baby seedlings. Then she runs a PVC pipe through the homemade wire cages. This offers a ton of support and keeps her cages from ever falling over. If you look at her pictures, her tomato plants come out looking more like trees so she needs a lot of support. Since it appears this cage is holding her tomato ‘trees’ up, I don’t think any homesteader would have a problem out of their tomatoes not standing tall with this option. 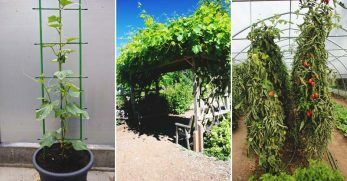 This post gives you trellis and cage ideas but it also gives you the how-to and the pros and cons of each. It begins by covering cages like the wire mesh and concrete wire mesh cages. Then it moves on to cover other methods, like the post and twine method. The really awesome thing about this article is that it also includes the cost to build each. 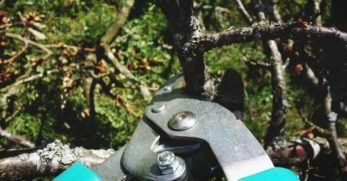 So if you are someone looking for the most cost-effective method to build a trellis or tomato cage then this article should be able to help you. It even covers options that you buy versus creating yourself. One of those options is Texas Giant tomato cages. He gives you the cost of each of them and what they are capable of withstanding. The only downfall stated is that they are not widely available. 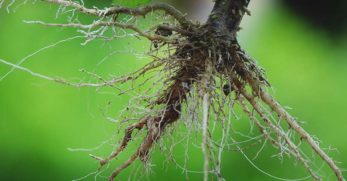 So for those of you that are kind of browsing around trying to figure out what to do about staking your tomatoes this year, this article might be very helpful. 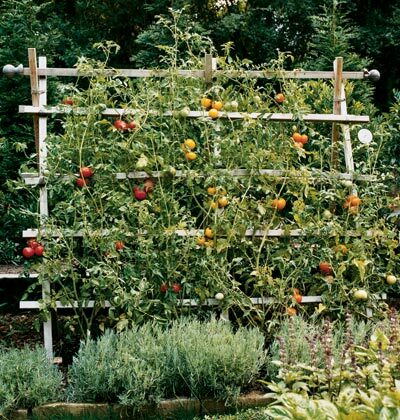 This is another simple and potentially free idea to building a tomato trellis. I love free so let’s get started on how to construct this masterpiece. You’ll begin by collecting old pallets. After you get them you’ll need to take them apart. Next, you’ll need to form A-frames on either side of the garden bed. After your A-frames are constructed, then you’ll take some of the slats and run them horizontally between the frames. You will need to tie up the tomatoes in order to train them to grow up the trellis. And one thing that should be mentioned is how great this trellis is for lack of maintenance. It may look rustic but it is fully functional and should last quite a while. I love this garden idea. 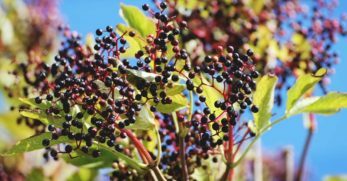 I am all about things that add character to any homestead, large or small. These will certainly do it. So you begin by finding old pallets that have been tossed aside. Don’t worry, you are about to bring these precious little guys back to life. You will deconstruct the pallets by just keeping the part with slats available. The rest of the pallet can be put on hold for a while. 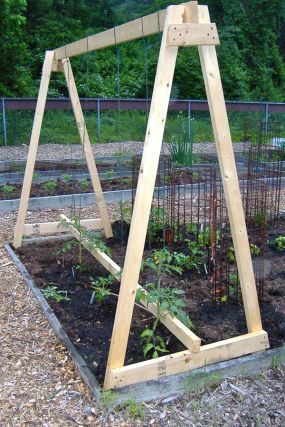 Then take two flat pallet sides and tie them together where they form an a-frame over the tomatoes. You will need to tie the tomatoes to the pallets in order to train them where to grow. However, the funky part is what she did to add the character. She actually paints hers all sorts of bright colors. It looks really amazing. 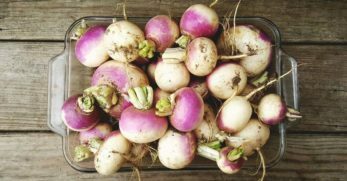 I know homesteaders don’t always have the time to do all of the crafty stuff we’d like, but if you can swing it…go for it! This is a very practical tomato cage for someone growing their tomatoes in a pot. 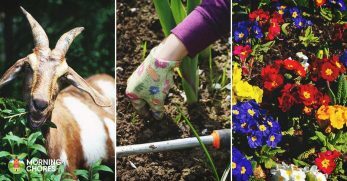 To start, you’ll need a fabric grow bag, some metal posts, and wire fencing. What you are going to do is to place the tomato in the grow bag. Once the grow bag is in place, you are going to wrap the wire fencing around the bag. It is important to note here that your fencing should be about six feet tall. Then you’ll need to place two metal posts on opposing sides of the wire fencing. This will help support everything. I don’t see this as a good solution for those with a large garden or even those who plant their tomatoes in the ground. 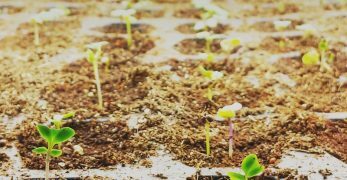 However, if you are someone who just likes to plant a few tomatoes in a pot out back, or if you are someone who is an urban or apartment homesteader this is a great option for you. You can buy your fabric grow bags here, and then you are ready to get started.